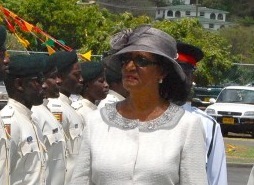 The following is the text of the 2014 Throne Speech, as delivered to the Houses of Parliament, by Governor-General Dame Dr Cécile La Grenade, on the occasion of the Third Session of the Ninth Parliament, at the Grenada Trade Centre on 16 October. Our nation embarks upon this Third Session of the Ninth Parliament with a strong sense of national unity, economic recovery and hope. My Government fully recommits itself to our time-honoured principles of democracy, social justice and the rule of law. Initial work has commenced on a permanent home for our Parliament and my Government is committed to having this most important symbol of our democracy completed in the shortest possible time. It is with pleasure that my Government notes that all members of Parliament have now made their first declarations to the Integrity Commission. This is an historic development, which will help to improve the standard of governance in our Country. The process continues to secure declarations from other persons covered under the Integrity in Public Life Act. To date, declarations have been received from Legal Officers, Senior Police Officers, Prison Officers and Customs Officers. My Government is also pleased to note that the Integrity Commission is collaborating with the Organisation of American States in respect of the implementation of the Mechanism of the Inter-American Convention Against Corruption. My Government affirms its commitment to constitutional reform. Our nation must be mindful that constitution reform is a journey, a long journey, and that “the journey of a thousand miles begins with the first step.” Very soon, our nation will have the opportunity to take our first steps on the journey of constitution reform. Having endorsed the recommendations of the Constitutional Advisory Committee, my Government confirms its intention to bring legislation to Parliament for Constitution Reform. Subject to parliamentary approval, my Government will put to the people, a referendum on several amendments to our Constitution in the first quarter of 2015. In the intervening period, the public education campaign will intensify, to help citizens understand the matters that will be placed before them, at the time of the referendum. This is an opportunity which must be fully grasped by all citizens; irrespective of class, religion or political affiliation. My Government’s foremost priorities in this Parliament remain: building the New Economy; investing in our people, especially our youth; and uniting our nation. In January of this year, the Home Grown Programme, designed by Grenadians for Grenadians, commenced. Putting the nation’s fiscal house in order is a first and vital step to attracting investments and creating much needed jobs. These are yet early days, but the initial results of the Programme have been very encouraging, with the economy growing for a second consecutive year; an improved fiscal situation; and rising confidence in Grenada’s investment climate. The details of the Home Grown Programme have been fully disclosed and the Monitoring Committee established by the Committee of Social Partners has commenced its important work. My Government expresses appreciation to the International Monetary Fund (IMF), and other development partners such as the World Bank, European Union, the Caribbean Development Bank, the United Kingdom, Canada and the Eastern Caribbean Central Bank for their support of the Programme. My Government is now preparing the 2015 Budget which it intends to bring to Parliament at the end of November of this year. The Budget will be consistent with the Home Grown Programme, with its priorities set to include securing fiscal and debt sustainability; investing in the productive sectors for growth and job creation; and investing in human development such as health, education and housing. My Government is very mindful of the calls of our people, led by the Social Partners, to take deliberate steps to ensure the gains of the Home Grown Programme are protected and sustained. In this regard, my Government will take the unprecedented step of bringing Fiscal Responsibility legislation to Parliament before the end of this year. Now that the fiscal situation has been stabilised and has begun to improve, my Government’s focus is on maintaining fiscal discipline while facilitating private sector-led growth, which is intrinsic to job creation. In this regard, my Government has reviewed the current Investment Incentives framework and will soon be tabling legislation to further improve Grenada’s business climate. The legislation will provide for greater transparency, predictability and efficiency to all investors – local and foreign. In pursuit of faster job creation, my Government will expand its support for small business development through the Grenada Development Bank and the Small Business Development Centre of the Grenada Industrial Development Corporation. My Government will increase the amount allocated to the Small Business Loan Scheme, and it will work diligently to address the inefficiencies identified during the first year of the programme. Beneficiaries of the small business loan are also urged to be fully responsible in meeting their repayment requirements so as to ensure the continuance of the programme, for the benefit of other citizens. Consistent with the job creation focus of my Government, the employment agency in the Ministry of Labour will become fully operational. The regulations and fees for work permits will also be revised. Following the completion of the current work being done by the Tripartite Committee, with technical assistance from Canada, new legislation will be brought to Parliament to revise the Labour Code. There will also be a revision of the Occupational Health and Safety law. Over the past 18 months, my Government has listened carefully to the Social Partners who have strongly articulated the need for a long term national plan. My Government has now taken steps to commence the development of national Plan 2030. This Plan will be designed by Grenadians for Grenada, with appropriate technical support as required. It will build on the Poverty Reduction and Growth Strategy: 2014-18. It will focus on a model of development that is people-centered, with a major focus on production, job creation and greater self-reliance. The ultimate aim of national Plan 2030 is shared prosperity: jobs for persons who wish to work; business opportunities for those who choose to invest; and social justice for all who believe in equality and human rights. All citizens will be called upon to articulate their hopes, dreams and aspirations in this plan. My Government recognises the critical importance of the Public Service for a new and modern economy. For this reason, the Public Service must be given the highest level of attention and support, starting with the enactment of a new Public Service Act and revised Staff Orders. There will be a strong thrust to raise the competency of public officers at every level, especially the middle and senior ranks. Accordingly, my Government will introduce Qualifications and Competency Frameworks, targeting a set of minimum qualifications to fill certain positions and core competencies to deliver results. These frameworks will cause a shift from a certification-centered culture to a skills-focused culture in the Grenada Public Service. Furthermore, talent identification and development is essential. Both senior and middle managers will be expected to perform the role of talent scouts in supporting the development of talent in the Public Service. Public servants will be promoted on the basis of merit; not longevity. With this in mind, there will be a more active rotation policy aimed at giving public officers more experience across Government and ensuring higher levels of competence, instead of complacency. It is important that public servants embrace this contractual mandate of being asked to serve in any area of the Service. The Pension Disqualification Act of 1983, apart from being manifestly unfair, is inhibiting the ability of the Public Service to attract and retain top talent. To address this issue, my Government will press forward with pension reform to deal with certain inequities in the current arrangements for public servants appointed after April 04, 1983; as well as seek to rationalise the various pension laws operating in the Public Service. My Government is committed to the further professionalisation of both the Customs and Excise Division and the Inland Revenue Division. This process includes ensuring high standards of integrity and competence at all levels. To this end, my Government intends to strengthen the legal framework by tabling a new Customs Bill and a Tax Administration Bill. My Government will recruit trained and experienced professionals and will continue to provide opportunities for training and professional development for staff of the Customs and Inland Revenue divisions. My Government commends the many honest and hardworking public officers whose integrity and professionalism are to be admired and emulated. That said, my Government remains concerned about the lack of high ethical standards among some public officers in the revenue collection agencies of Government. No effort will be spared to raise those standards and/or remove such persons from their posts. There will be no safe haven in the Public Service for persons whose job it is to collect Government’s revenue but whose dealings deprive the people of our country of much needed resources to provide services such as medicines at our hospitals and clinics, repairing roads, delivering education to our students, and supporting our farmers and fisher folk. The high cost of electricity remains a binding constraint to Grenada’s growth and competitiveness. Accordingly, my Government is preparing a new Electricity Supply Act which is expected to be tabled in Parliament in 2015. The areas for focus include tariff setting, use of renewable sources of energy and provision for regulation through the Public Utilities Commission, to be eventually succeeded by the Eastern Caribbean Energy Regulatory Authority. Cognisant of the critical role of infrastructure for economic growth, my Government places high priority on flood mitigation and slope stabilisation projects. My Government will increase spending on Special Projects which are aimed at improving community infrastructure. Those projects not only serve the critical functions of building communities, but they also provide short term employment. Consistent with the policy of my Government, all contractors are reminded to utilise, and give first priority to unskilled labour from the communities in which they are working. In regards to our road infrastructure, my Government is acutely aware of the deterioration of our nation’s roads. 2015 will see an increase in the funds allocated for the maintenance of our roads, especially now that the Asphalt plant is fully operational after several years of not being functional. Agriculture has a central place in the New Economy as a major contributor to food and nutrition security, employment and foreign exchange. My Government is deeply concerned about Grenada’s high food import bill. My Government will continue and complete the commercialisation of Government estates to deliver more productivity, more employment and more foreign exchange for our Country. My Government is pleased with the new direction of the Marketing and national Importing Board, but will continue to push for more to be done to help our farmers market their produce, and at good prices. There will be ongoing support for high value crops such as soursop; more farm labour support; more planting materials and more support services. The thrust in agro-processing, including nutmeg and cocoa processing, will be given more support. My Government believes that the consumption of more local food is essential to health, wealth and a sustainable lifestyle. Consequently, growing local, buying local and eating local will be a major focus of our national food and nutrition security plan. This thrust will begin with a strongly articulated conviction that local is healthy. Local is wholesome. Local is better. This will require a national effort as we re-orient the national psyche and raise a new generation of our children to believe in, and consume local produce. My Government is committed to making Grenada a world class tourism destination. To this end, considerable focus will continue to be placed on hotel development; marketing; airlift; improving existing attraction sites and developing new attractions through private investment and public private partnerships. My Government will invite proposals to commercialise selected attraction sites, including our major forts. My Government believes that Grenada needs at least 3,000 hotel rooms, and will therefore continue to offer incentives to investors (local and foreign) who are interested in hotel and resort development, especially at 5-star or higher quality. This critical mass of rooms is needed to strengthen Grenada’s ability to negotiate airlift. To that end, my Government is heartened by the two new hotels which are currently being designed. Work will commence on at least one of those by the end of November, as Government continues to actively pursue more hotel investments. My Government will continue to build partnerships with airlines that focus on marketing of Grenada, rather than on revenue guarantees for the airlines. My Government is delivering results in this area with direct service from Germany in November, and the commencement of daily flights by American Airlines in December of this year. The preservation and development of our cultural heritage is a high priority for my Government. Indeed, the creative industry is part of the New Economy. As a consequence, my Government appointed a dedicated, veteran minister to drive this process. Following the recent development of a policy framework, my Government intends to bring legislation to Parliament to establish a Film Commission. The performance of Spicemas Corporation will be improved with a strong emphasis on planning, and more private sector participation in the marketing and delivery of Spicemas. Recognising that the safety of our citizens and visitors alike is paramount to our development process, my Government will continue to work with our law enforcement agencies; providing and facilitating the necessary training and technical and financial support to ensure that our men and women in uniform have the tools to perform optimally. The agencies will continue to collaborate with our friends and partners, such as the United States, Great Britain, Trinidad and Tobago, and other Caribbean countries, in the fight against crime. Small Island Developing States face an existential threat from climate change. In other words, climate change is a matter of life and death. Grenada will continue to play a leading role in advocacy on this issue. Moreover, we will pilot several initiatives in green or renewable energy; with a particular focus on community projects, such as retrofitting and solar PV lighting. Healthcare is one of the most strongly articulated needs of our citizens. My Government will intensify its efforts to strengthen primary health care with expanded services and extended hours of services at health clinics across the Country. The recent challenges with vector-borne viruses such as Chikungunya, should be cause for our nation to reflect on the current practices of wanton littering and waste disposal. Such behavior is not only degrading, but damaging to our health and our environment. My Government calls on all citizens to take more personal responsibility for keeping our surroundings clean. With the threat of the Ebola virus around the world, my Government is actively in the process of safeguarding our shores from this deadly virus. In close collaboration with our regional partners, we have heightened preparation efforts, including the outfitting and training of medical personnel to treat patients; ordering of supplies; increased public awareness of the virus; as well as considering enacting relevant travel restrictions and screening mechanisms for visitors. My Government is committed to the establishment of a new hospital. This new hospital will be owned by Government but will be part of a medical park developed through a public-private partnership. The new hospital will serve as a nucleus around which Grenada will attract investments in medical tourism. The positioning of Grenada as a medical tourism destination will be done in partnership with St George’s University; leveraging its impressive brand and track record in the field of medical education. The long term prosperity of our nation requires a sound investment in our children and youth. My Government is committed to improving the relevance and quality of education offered in our nation’s schools. With this in mind, there will be a special focus on securing higher levels of proficiency in Reading, Mathematics and English, and offering more technical and vocational skills training. To improve learning outcomes, my Government is committed to the increasing use of technology in the delivery of instruction and its accessibility to our children as they navigate the 21st century. More scholarships for study will also be sought after, and provided. My Government is very concerned, not only about the high level of unemployment, but also the skills mismatch in respect of the needs of the job market. This situation will be addressed on several fronts including revision of the national Training Policy and Priorities, sourcing of scholarships, programmes of the National Training Agency, TA Marryshow Community College and St George’s University. My Government will continue to provide skills training and employment opportunities for our youth through the Imani Programme. In the area of sports, my Government expects to complete the reconstruction of the Athletics and Football Stadium in 2015. This facility, together with the Cricket Stadium, will be used to promote Grenada as a sport tourism destination. My Government will actively seek to bring international games to Grenada in an effort to boost tourist expenditure, secure significant marketing exposure for our destination, as well as to inspire a new generation of world-class, competitive sportsmen and women. My Government is very cognisant of the considerable housing needs of our citizens. In this regard, there will be significantly expanded programmes for house repair and expansion. In addition, a major focus will be Phase II of the Housing Programme with the People’s Republic of China. Public-private partnerships for middle income housing will also be pursued. To that end, my Government has signed contracts with two private sector firms for the construction of low and middle income houses to help meet this most desperate and basic need of our citizens. We will also move forward with the expansion of the soft loan programme; as well as the house repair programme. My Government is very cognisant of the powerful role that Information and Communications Technology must play in the New Economy. In this regard, a comprehensive and integrated IT Strategy will be pursued to advance Grenada’s development. My Government understands that healthy familial relationships build healthy communities and ultimately, a healthy nation. My Government will continue to support parents through the national Parenting Programme. This includes delivering parenting education sessions at antenatal clinics, meetings of Parent Teachers Associations and at the community level. A special programme will target parents of juveniles. My Government is pleased to announce the completion of its Gender Policy and Action Plan. The main objective of the Policy is to create an enabling environment for the attainment of gender equality in the lives of Grenadian men and women, boys and girls. Given our current realities in respect of educational attainment and conflict with the law, our boys are a particular focus of the policy. My Government is committed to gender equality. In this regard, it will implement its recently developed Gender Policy. My Government is committed to the reduction of gender-based violence in Grenada, Carriacou and Petite Martinique. To this end, it will continue to implement the Strategic Action Plan on Gender Based Violence. The main focus will be raising awareness of its harmful effects on victims and perpetrators. Citizens must understand that domestic violence is a crime under the laws of Grenada, and that they will face prosecution if they commit such crimes. My Government will continue to put measures in place to improve the quality of life for our elderly citizens and to make services more accessible to them. My Government reaffirms its strong commitment to ensuring that adequate safety nets are maintained throughout the Home-grown Programme to protect the poor and vulnerable in our Country. A Social Safety Net Policy Framework has been completed and adopted. This Framework requires a paradigm shift in the delivery of safety nets with a focus on moving from dependence to development and empowerment. In 2015, there will be an increase in resources for poverty alleviation, transportation allowance, and in the overall allocation for the Needy Assistance Programme for our most vulnerable citizens. My Government will continue to collaborate with the OECS Commission, USAID and other partners to ensure the opening of the Grand Bacolet Youth Rehabilitation and Treatment Centre during 2015. My Government will also commence implementation of the Juvenile Justice Act. The ultimate aim is to provide young offenders with a second chance to make a positive contribution to their society. Uniting the people of Grenada, at home and abroad, remains a top priority of my Government. In this regard, my Government extends an invitation to all Grenadians, at home and abroad, irrespective of political affiliation, to join hands as we build a just and prosperous society; not just for ourselves but for our children and grandchildren. My Government remains deeply committed to social dialogue through purposeful engagement with all social partners. In this regard, it will continue to accord the highest priority to the work of the Committee of Social Partners, which comprises Labour Unions, Businesses, NGOs, Churches and the Government. It is the hope of my Government that the Social Compact will be signed and tabled in Parliament during this session. My Government will continue to support the national Social Partners Forum – an initiative of the Committee of Social Partners, aimed at public engagement on issues of national importance. My Government has set out its major priorities for this Parliament: Building a New Economy, Investing in Our People and Uniting Our Nation. The details will be elaborated on when my Government presents the 2015 Budget at the end of November. May God guide you in all your deliberations and render you equal to the sacred trust bestowed upon you. May God bless Grenada, Carriacou and Petite Martinique.